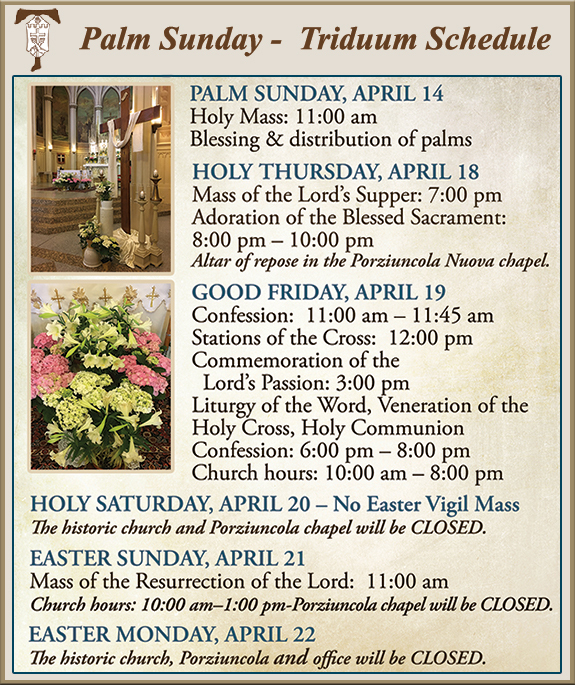 As the Solemnity of Easter approaches, the Shrine of St. Francis offers you an opportunity to assist in beautifying the Church — as a sign of our praise of the Risen Lord. YOUR DONATIONS will assist the Shrine in adorning both the St. Francis church and the Porziuncola chapel with beautiful flowers. Please consider making an Offering for the intention of: a deceased or sick loved one or for prayers for yourself or others. On a blank envelope, please identify your donation for "EASTER FLOWERS". Along with your gift by cash or check *(payable to National Shrine of St. Francis of Assisi), please provide: 1) the name of the person who is the intention of the offering, 2) whether deceased, sick, etc., and 3) your name and number. OFFERING ENVELOPES may be placed in the Collection basket at Mass or deposited in the center aisle Donation box in the rear of the church. You may also mail your donation. 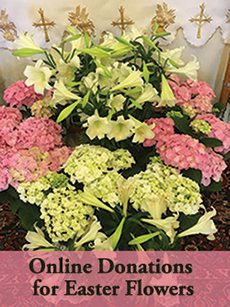 Note: Credit Card donations may be submitted on-line HERE In gratitude, the Shrine will post the names that are dedicated in our Bulletin and in the back of the Church in the weeks following Easter Sunday. O Lord Jesus, in order that the merits of your sacrifice on the Cross might be applied to every soul of all time, you willed that it should be renewed upon the altar. At the Last Supper, you said: â€œDo this in remembrance of me.â€� By these words you gave your apostles and their successors the power to consecrate and to the command to do what you yourself did. I believe that the Mass is both a sacrifice and a memorial â€“ reenacting your passion, death and resurrection. Help me to realize that the Mass is the greatest gift of God to us and our greatest gift to God. Lent is a time for fasting from any number of things — favorite desserts, hypnotic television, and pervasive texting. On the other hand, this is naturally not time to fast from the spiritual goods. In fact, we can increase the spiritual goods in Lenten fashion and at the same time gain several plenary indulgences — an indulgence which removes all the temporal punishment due to sin — not just to apply to ourselves but to especially to those in purgatory. That is a spiritual work of mercy that's a great partner with any fasting. In fact, gaining the indulgence might require some sacrifice, especially of time. That would bring in some fasting from non-essentials like social media. There is actually one more: You must "have the interior disposition of complete detachment from sin, even venial sin." The National Shrine is not only located in the heart of San Francisco where Italian North Beach and Chinatown meet, it is "The Heart of San Francisco" in a singular way where Heaven and Earth meet like no other place in our city. One of the reasons this Shrine is unique is its very urban location in the second most densely populated city in the country. But in the midst of an often rowdy, noisy, bawdy, and chaotic neighborhood (a bronze marker in the sidewalk reminds us that this was once "The Barbary Coast"), the Shrine's Church and the Porziuncola offer an oasis of peace, quiet, serenity, and refreshment to the thirsty spirit. Saint Francis was very aware that all of God's creation is holy and that it reflects his beauty, truth, and goodness. But Francis appreciated churches, especially, because he knew that in these sacred spaces people could find and recognize the presence of God's spirit more easily than "in the world." That is why the Little Poor Man of Assisi dedicated a good portion of his life to rebuilding old abandoned churches, like San Damiano (where he had heard the voice of Jesus Christ) and Saint Mary of the Angels Porziuncola (or Little Portion). We hope during your online visit to The National Shrine of Saint Francis of Assisi you will experience something of the reverence, tranquility, and blessings people find when they enter our actual doors. 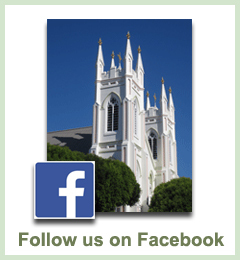 Thus, we invite you to take the virtual tours, light a candle, ask for our prayers, and to return to this site as often as you like, while allowing "The Heart of San Francisco" to become a place where your own heart can find a haven of rest. Yes, leave your heart in San Francisco! We also invite you to take the opportunity to participate in the mission of The National Shrine of Saint Francis of Assisi by sharing with us your financial support, either by making a donation or by shopping at our online store. But even if you're unable to give anything at this time, please know that you are always welcome to visit us and to support our work with your prayers. We sincerely appreciate and thank you for your generosity of spirit. The National Shrine of Saint Francis of Assisi, as with The Archdiocese of San Francisco, has a mission that is rooted in the Gospels and the social teachings of the Roman Catholic Church. Central to that teaching is the inherent dignity and sacredness of each human being. We educate and advocate on this dignity in relation to the unborn child, the prisoner on death row, the homeless and hungry person on our streets, the elderly, the ill and disabled faced with the threat of assisted suicide, the stranger in our midst, and the poor and marginalized in our society and throughout the world. We are neither right nor left, Republican nor Democrat, but we formulate our agenda by the standard of human dignity that is reflected in our faith tradition. It is the purpose of the National Shrine of Saint Francis of Assisi to provide more abundant means of salvation, through the rich liturgical and devotional life of the Roman Catholic Church for the Christian faithful, including those who come as pilgrims from around the world to the City of San Francisco and the greater San Francisco Bay Area, who seek to encounter the living God through religious worship and special devotion to St. Francis of Assisi and the Franciscan saints. It is the further purpose of the National Shrine to welcome, share and extend this same spiritual experience and devotion to St. Francis of Assisi and the Franciscan saints to pilgrims and visitors of all faiths, religions, denominations, and nationalities. The Capuchin Franciscan Friars (OFM Cap.) and Staff of the National Shrine, therefore, provide a pastoral (i.e., welcoming and prayerful) environment with the hope that in the spirit of St. Francis of Assisi, spiritual nourishment healing and reconciliation will be found by all who visit the Shrine. Let us, therefore, have charity and humility and give alms because it washes the stains of our sins from our souls. Letter to all the Faithful. As a merchant, Francis would have been taught to value making a profit and learning how to promote himself in order to sell the product. In looking at Jesus and His passion, however, Francis became convinced of the importance of the virtues of charity and humility. He learned that he needed to cultivate these virtues to find true happiness. Meditating on the passion of Christ, Francis let his heart be humbled by the Lord's compassion, and so let God transform his life into one of charity and generosity. He could preach with love to kings and peasants, to the sultan of Egypt and the beggars by the side of the road because he saw in each one someone redeemed by the precious blood of Jesus shed on the cross. He constantly meditated on Jesus' sacrifice, especially during Holy Week, the time of sacred remembrance in the Church. May the Lord bless and keep you during this Holy Week and always! Fr. Robert Barbato, OFM Cap. is the pastor of Old Mission Santa Inés in Solvang, CA. WOULD YOU LIKE TO HAVE A MASS SAID IN HONOR OR MEMORY OF SOMEONE? It is easy! Simply visit the Mass Intentions page of this website and find and request available dates and make offerings online. Or, email or call the Shrine office admin@shrinesf.org, (415) 986-4557.
your preferred date (we will try our best to accommodate), and the suggested offering is $10 for one Mass. Mass Intentions can also be used to remember someone's birthday, anniversary, or other special occasion. Your donation is payable by credit card on the website, or cash or check that can be mailed to the Shrine office. Please note starting Sunday, Nov. 18 the Shrine Rector introduced the daily recitation of the St. Michael Prayer immediately following the final blessing of Mass for both Sundays and weekdays, at the suggestion and encouragement of Archbishop Cordileone. With the 2018 revelations of scandal involving several members of the episcopate and the clergy, Pope Francis asked the faithful around the world to pray for the protection of the Church against Satan, the "Great Accuser", ending it with the prayer to St. Michael the Archangel or the ancient prayer "Sub Tuum Praesidium" dedicated to the Virgin. Several bishops around the U.S. and the world have asked for the reintroduction of these prayers. The St. Michael Archangel Prayer can be found on the back cover of the missalettes located in the Shrine pews. Also, a limited number of St. Michael prayer cards are available upon request.